McDonald vs McCurry. One is established fast food chain in the entire world and generate multimillion worth of dollar in revenue while another is a local popular eatery in Jalan Ipoh on the edge of Kuala Lumpur’s downtown. 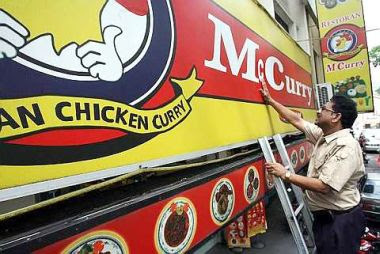 According to websites, McCurry stands for "Malaysian Chicken Curry". The outlet is a fast food, self service and open restaurant set-up concept and is of international standard. It's a 24 hour restaurant which serves authentic Malaysian and Indian dishes. It serves traditional dishes like teh tarik, roti canai, nasi lemak, nasi briyani, fish head curry, chicken tandoori, naan bread, tosai, chapaati and various chicken and mutton curry dishes. But the lawyers of McDonald's restaurant had argued that they have exclusive rights on the prefix 'Mc' and only they can use it on their products and services. They had said that McDonald's has created this prefix and has the right to protect it under the law. According to McDonald's, McCurry was infringing their creative rights by using the prefix in their name. They wanted the court to ban the McCurry from using the prefix. Well , they lose and McDonald’s will have to pay RM10,000 to McCurry. The recent McDonald's v. McCurry ruling is not surprising. Just by the three main DuPont factors alone, appearance, sound and meaning, these two marks are arguably not confusingly similar. Add to that the difference in menus, and the difference in trade dress, and you have a pretty strong case for McCurry, which the panel seemingly accepted. The letters "Mc" cannot be totally, exclusively owned by one entity worldwide. And it's not as if people are going to mix up McCurry with McDonalds. Now, if McCurry used the golden arches, had a clown and similar characters associated with the restaurant, that would be problematic. Those elements were not present in this case. On our site, http://www.trademarksprotected.com, we help with these trademark issues and any trademark questions.